The main focus of my blog is sharing ways we can all REFUSE disposable plastic, but I also encourage us all to RECYCLE. Not because it is the answer to our waste problems, but because I know that none of us lives a 100% waste-free life and it’s important to keep waste that can be used again out of the landfill. But what does it mean to recycle? 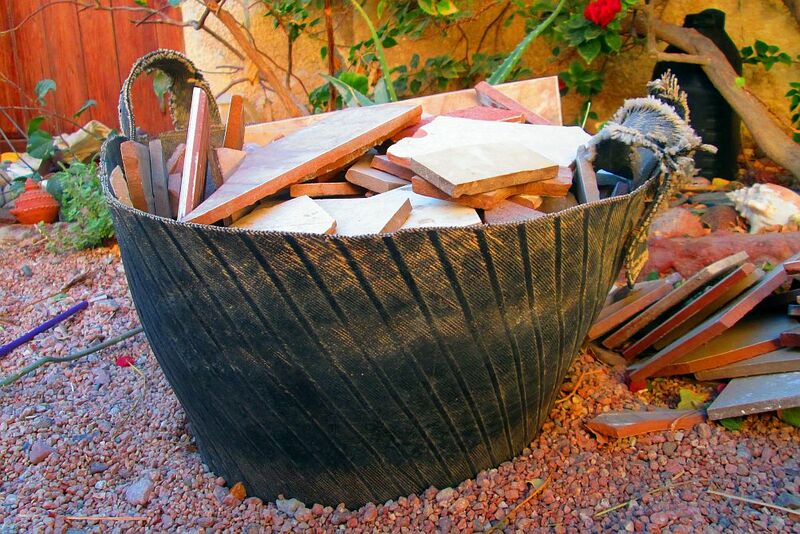 A bucket made from an old tire. Reusing or repurposing items is an excellent way to keep useful waste from ending up in the landfill. It helps save time, money, and energy. Technically, if a product is recycled, it is broken down into raw materials and be made into the same product. Used printer paper would be made into new printer paper. Discarded plastic water bottles would be made into new water bottles. But these processes are usually difficult and/or expensive, especially when it comes to plastic. So most of the “recycling” that is happening actually involves producing different material, not the same. 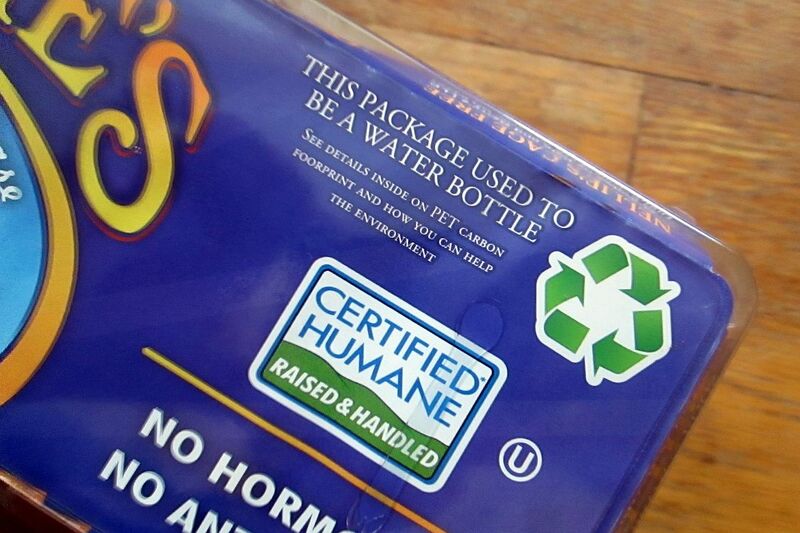 For example, water bottles are “recycled” and made into plastic egg cartons, like the one pictured below. Glass and aluminium are more often truly recycled into new glass and aluminium products but NOT plastic. Plastic is usually downcycled, or made into new material or products of lesser quality or usefulness. Over time, downcycling reduces the quality of a material. Plastic water bottles, when “recycled” are often mixed with other plastics to make a new lower-quality hybrid. This new material can then be molded into something like a park bench, carpet, or speed bump. Eventually, plastics that are downcycled reach a point when they cannot be used anymore and they end up as trash in a landfill. When waste material is truly recycled, that is – made into the same product, there are many environmental benefits. It prevents waste of useful materials. It reduces the consumption of new raw materials. It reduces energy use. It can reduce air and water pollution associated with traditional waste disposal. But since plastics are downcycled, the benefits are much less. New plastic water bottles are continually being produced, using fresh raw materials, using much more energy. We cannot solve the problem of plastic pollution by continuing to make new plastic products that cannot be recycled because there will still be a constant flow of new, or virgin, plastic – if there is demand. Our first priority, then, needs to be to REFUSE disposable plastic products when we can, REDUCE the amount of products we need, and REUSE them when we are able. The last resort before the landfill is to RECYCLE. Plastic shopping bags are not “recycled” here in Dahab so if you do only one thing to reduce your plastic footprint, let it be to bring your own reusable bag to the supermarket and green grocer. In my next post, I’ll talk about upcycling and crafting with reusables. Stay tuned! This entry was posted in Problems with Plastic, Recycling and tagged downcycling, plastic bottles, recycling, reuse, water bottles. Bookmark the permalink. Great post! We can’t just keep consuming like crazy and think throwing some plastic bottles in a recycling bin will solve our waste problems. Cut the stuff off at the source! Besides, most of the “food” packaged in plastic is unhealthy.